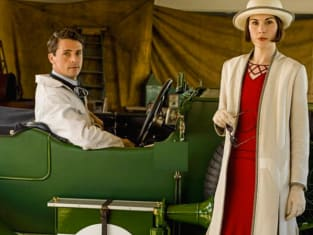 Mary watches Harry in his auto race on the seventh episode of the sixth season of Downton Abbey. Downton Abbey Season 6 Episode 7: "607"
Violet: You're a cruel little miss, aren't you? I'd feel sorry for Larry, if I didn't dislike him so much. Miss Crookshank: I shall forget you said that, but you should go now. Much more, and we may feel awkward when we meet. Which we are bound to do. Violet: I think not, Miss Crookshank. Not if I see you first. Permalink: I think not, Miss Crookshank. Not if I see you first. Isobel: I suspect she's quite a tough nut. Violet: And I'm quite a tough nutcracker. Permalink: And I'm quite a tough nutcracker.